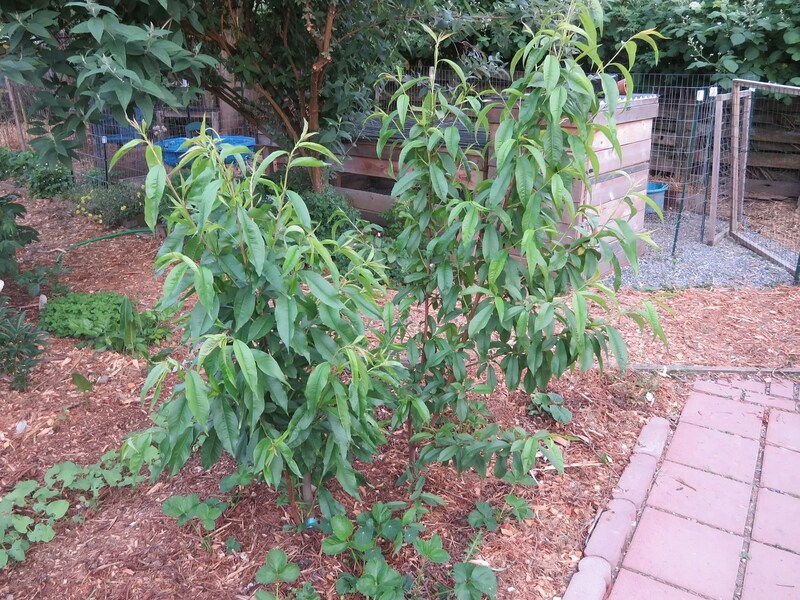 The peach trees are still doing fantastic. No leaf curl here! And the peaches themselves are still growing! 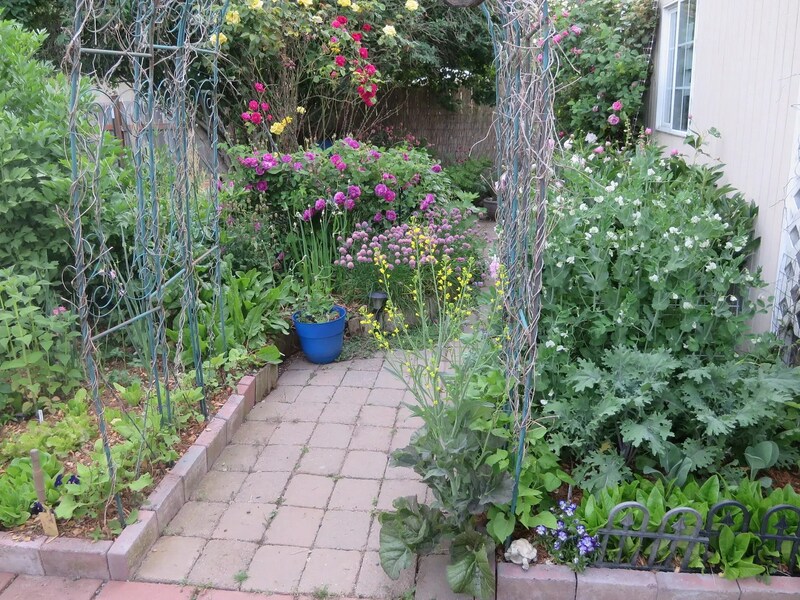 The rest of the garden is looking great, too. I love this time of year. 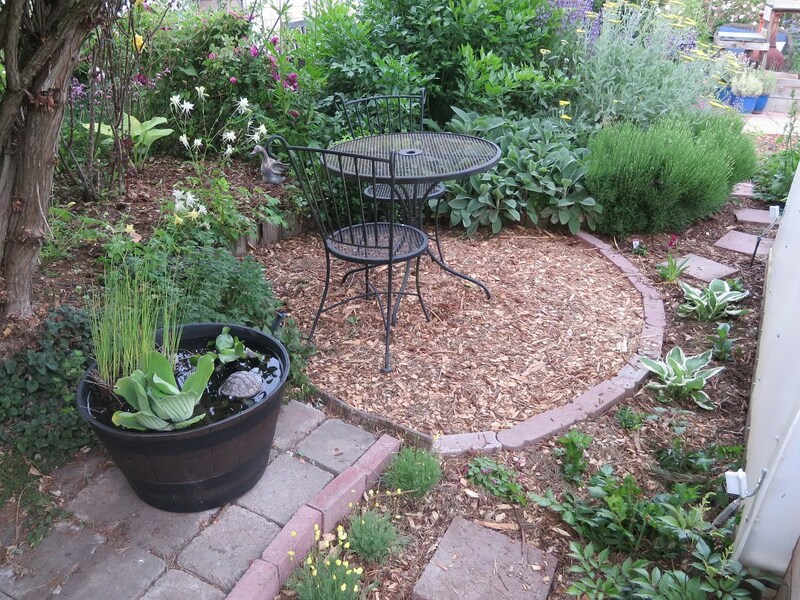 The wood chip mulch makes everything so woodsy. And so far, it’s really helping with the soil. 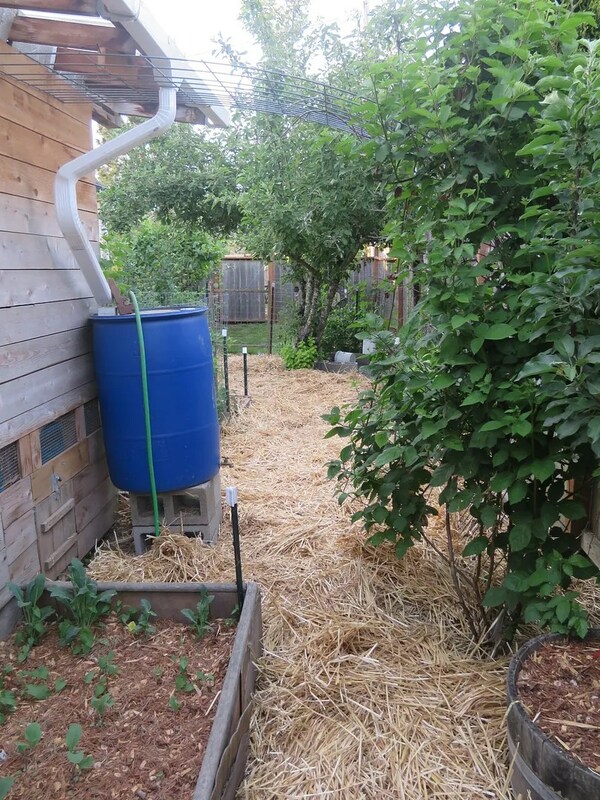 Although we’ve had some record scorchers, I haven’t had to water anything – other than a few things that I just put into the ground. 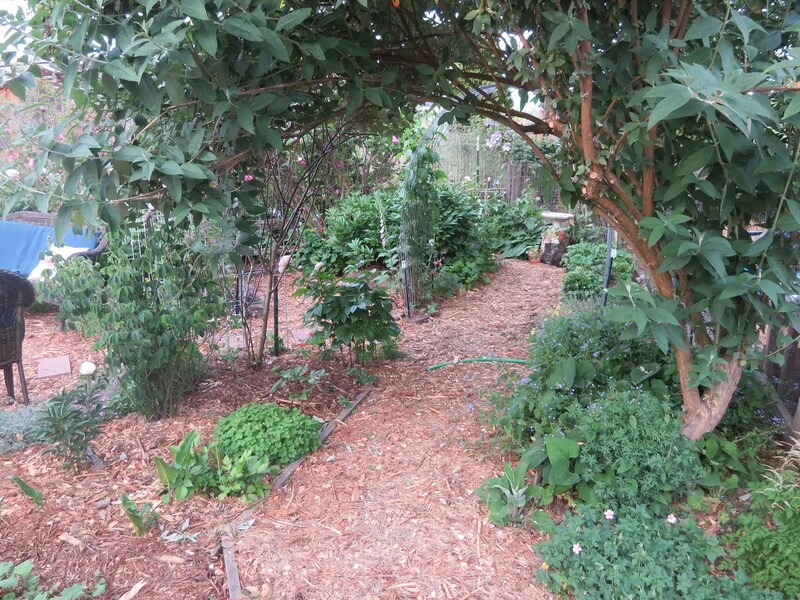 When I pull back the chips to plant, the ground is dark and rich and full of earthworms! 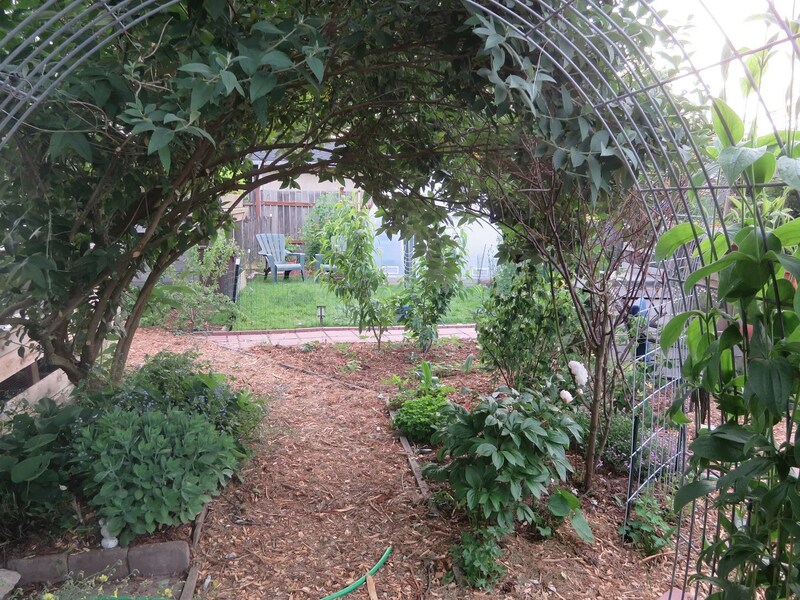 To the chickens’ great sorrow and lamentation, I blocked them out of the east section of the side yard. 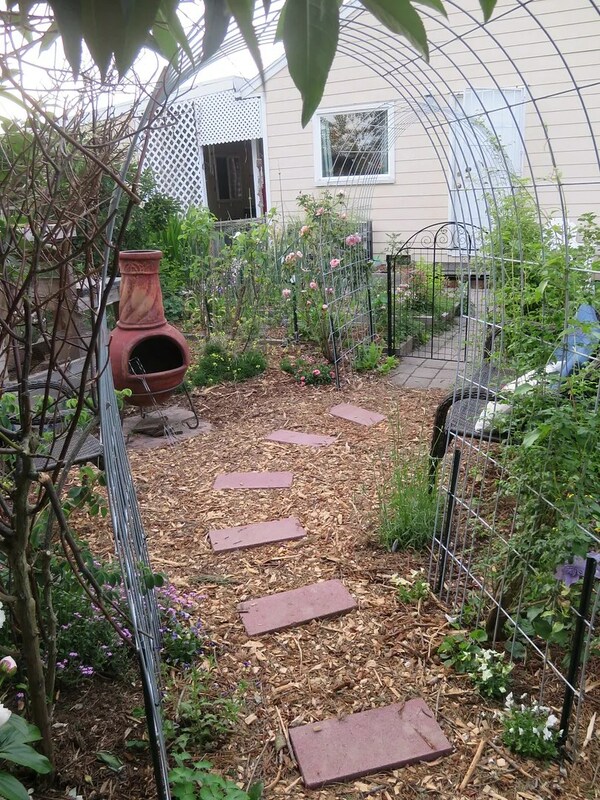 The plan next year, is to turn this part of the yard into a colony setup for meat rabbits. Right now, I’m growing a few excess squash and other things that the chickens would rip apart. 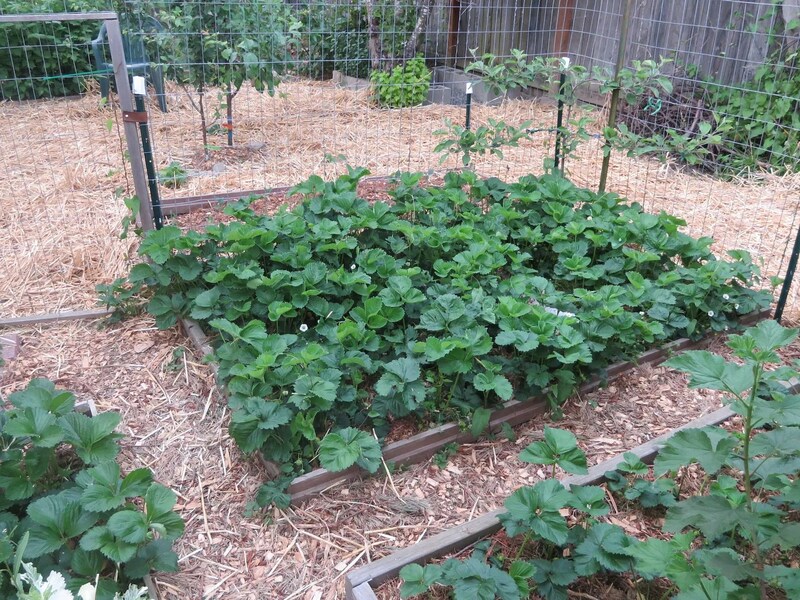 The strawberries are loaded with green berries, and see the little apple espalier in the corner? I love espaliers! So much fun! And this year? 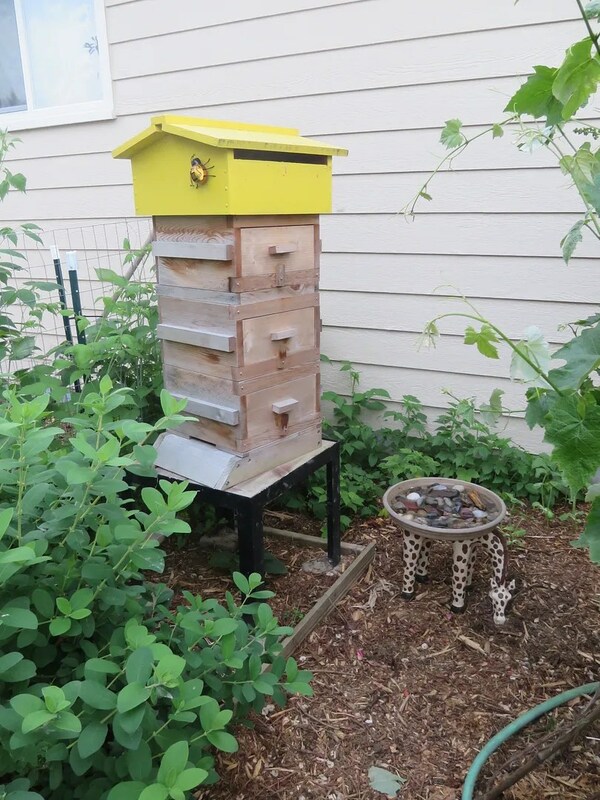 I think the bees are going to make it! 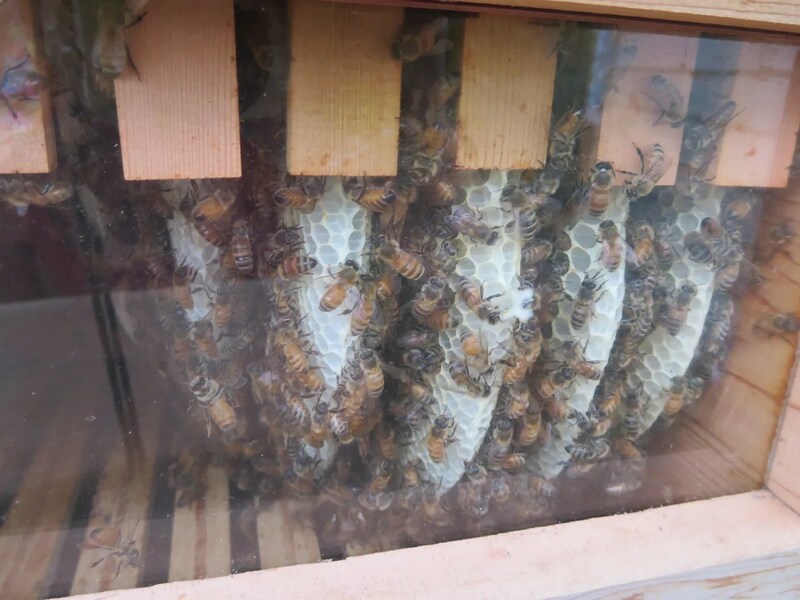 The queen is laying up a storm, and they are so self-suffient that they completely ignored the sugar water feeder I set up for them. Once I realized I was only feeding ants and hornets, I took it down. Also, don’t you love the little waterer I set up for them? It’s a giraffe footstool (formerly inside the house until I got tired of it) with a shallow bowl on top. I’m glad I thought to do this, rather than just donate the footstool! The newest trees, two little plums, are so cute. 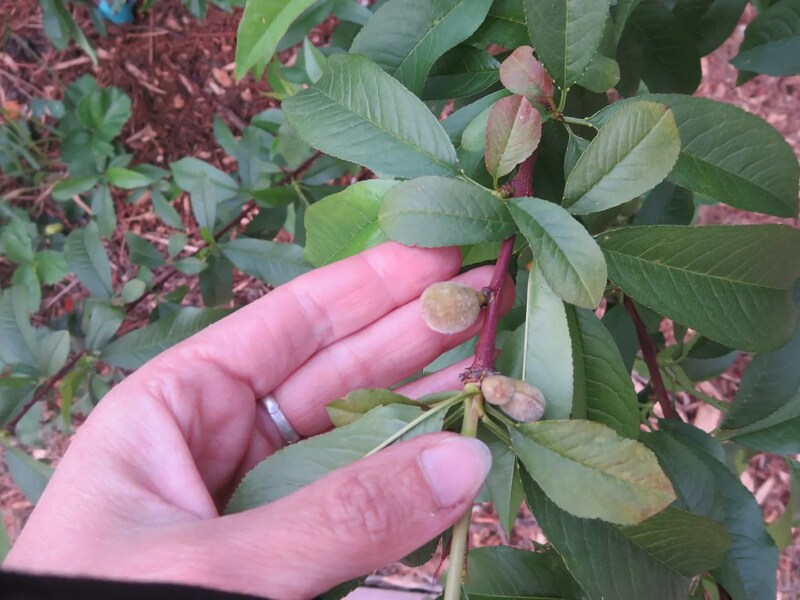 I did a count the other day, and I have TWENTY-FOUR fruit trees in my backyard. And this is not counting the bushes, like the gooseberries and blueberries. 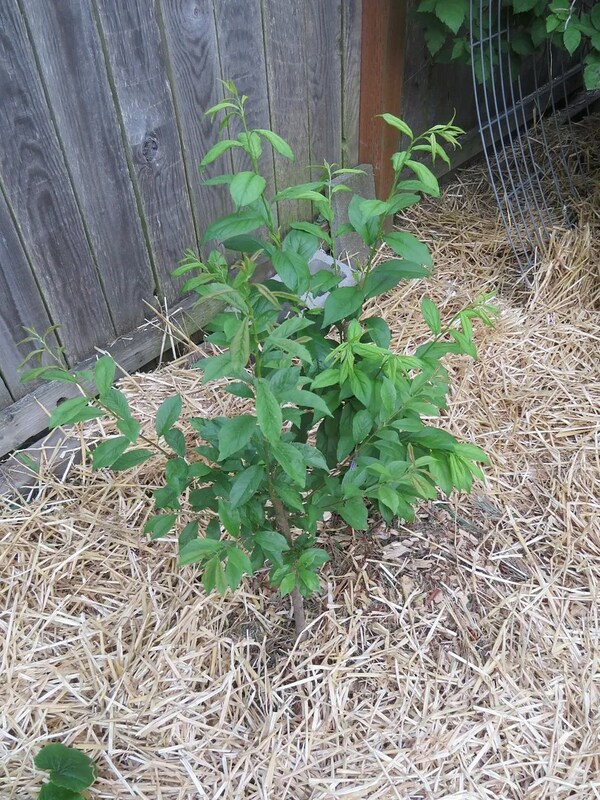 Grow a Little Fruit Tree changed my gardening life! 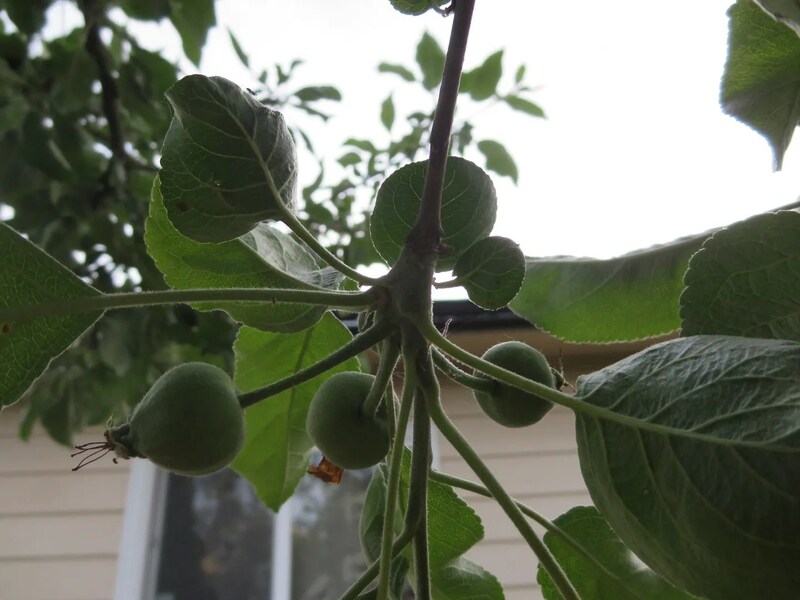 One of these plums is actually a plum/cherry hybrid, so I’m really hoping it fruits before too terribly long. I’m quite anxious to taste them! The three new ducks are all grown up now, and they are all three boys! Since I wanted a drake, and only intended to keep one anyway, it doesn’t mess up MY plans, but the friend I was planning to give the extras away too already has a male and needed females. So I have two cute little guys up on Freecycle as we speak. Anyone out there want some ducks? The one I’m keeping, I’ve named Montgomery. Maisie, Millie, and Montgomery! 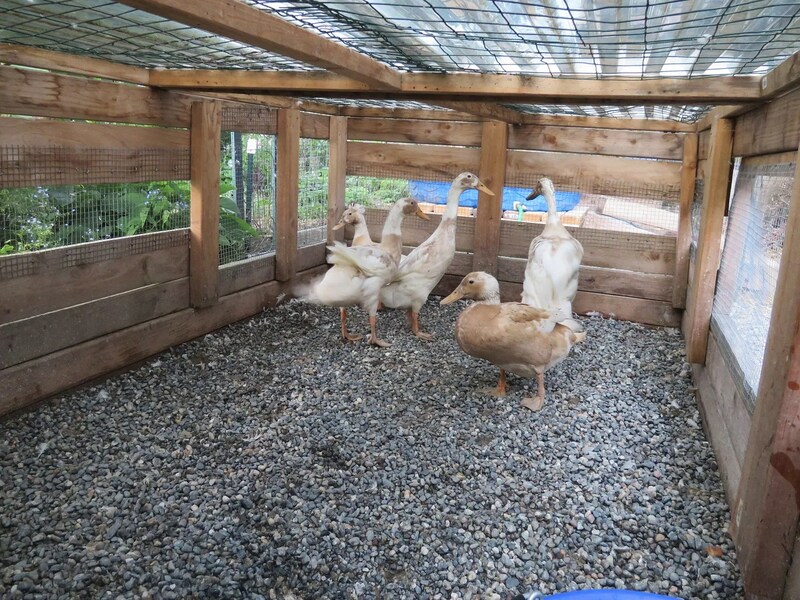 See the new pea gravel bedding inside their coop? They like it, and so do I. Much easier to just wash the poop away with the hose set to ‘jet’. Oh, and look! 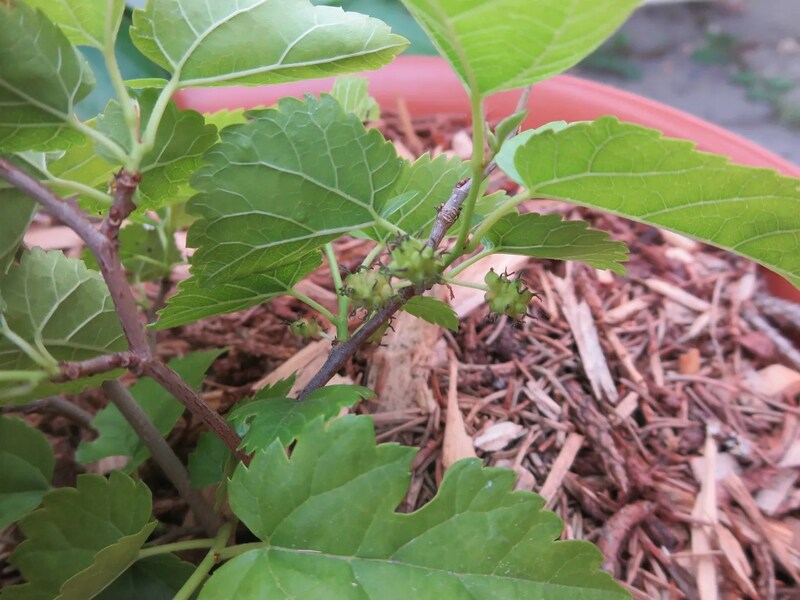 My teeny tiny little mulberry tree is producing mulberries this year! I’m so excited, because I’ve never even tasted a mulberry, but folks say they are wonderful. The most exiting news, however, is what’s currently in my incubator. While I am still absolutely keeping my coturnix quail, I’m branching out to bobwhites! I found a seller with Snowflake and pure white bobwhite quail eggs, and of the 12 I put in the incubator, 11 are currently developing into chicks. When they had only been four days in the incubator, I candled them, and was able to see their tiny hearts beating! Such an incredible experience! And the whites are so floofy! If you’re interested, I do recommend this seller. His eggs were wonderfully packaged, and although how they are treated by the post office is out of his hands, I’m impressed with getting 11 out of 12 to develop. Sounds like he raises his birds really well, too! 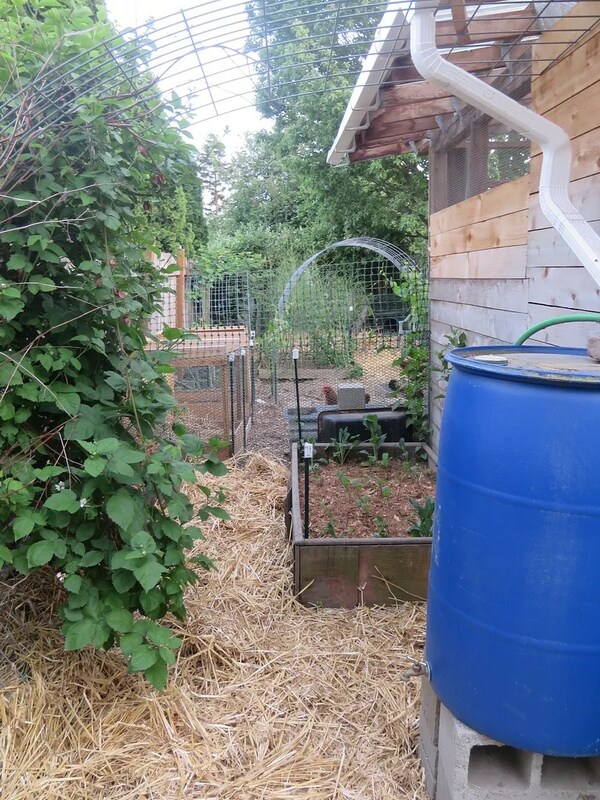 This entry was posted in Bees, chickens, ducks, Gardening, quail and tagged back to eden gardening, duck coop, fruit trees, Gardening, honeybees, indian runner ducks, snowflake bobwhite quail, white bobwhite quail, wood chips. Bookmark the permalink.